This rich, luxurious treatment cream intensely moisturizes dry to very dry skin while fighting the signs of aging—especially around the eyes, neck, and décolleté (chest). 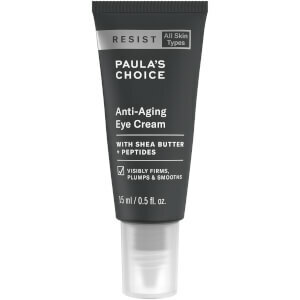 Its unique complex of antioxidants and retinol smooths fine lines and wrinkles and firms the skin by stimulating collagen production—all while protecting against moisture loss. Powerful skin-repairing ingredients repair signs of sun damage and assist with fading brown spots. Apply after cleansing, toning, and exfoliating. 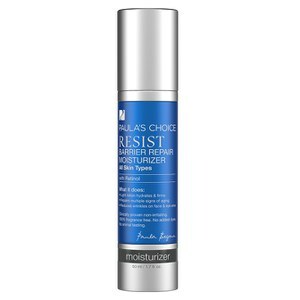 Resist Intensive Repair Cream works beautifully around the eyes, neck, and décolleté and may be worn under makeup. For daytime, wear under a Paula’s Choice foundation or pressed powder with SPF 30. 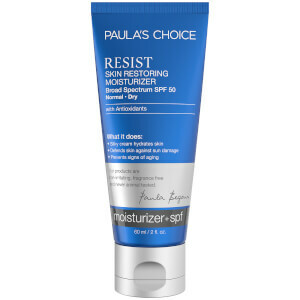 When combined with a sunscreen, the antioxidants in Resist Intensive Repair Cream boost the sunscreen’s effectiveness. Water, Ethylhexyl Stearate, Simmondsia Chinensis (Jojoba) Seed Oil, Butylene Glycol, Glycerin, Caprylic/Capric Triglyceride, Petrolatum, Cetearyl Alcohol, Dimethicone, Dipentaerythrityl Hexacaprylate/Hexacaprate, Glyceryl Stearate, Tridecyl Trimellitate, PEG-100 Stearate, Phenyl Trimethicone, Retinol, Adenosine, Palmitoyl Tetrapeptide-7, Palmitoyl Hexapeptide-12, Palmitoyl Tripeptide-1, Ceramide 2, Sodium Hyaluronate, Magnesium Ascorbyl Phosphate, Niacinamide, Tocopherol, Lecithin, Linoleic Acid, Linolenic Acid, Retinyl Palmitate, Glycyrrhiza Glabra (Licorice) Root Extract, Camellia Oleifera (Green Tea) Leaf Extract, Citrullus Vulgaris (Watermelon) Fruit Extract, Lens Esculenta (Lentil) Fruit Extract, Pyrus Malus (Apple) Fruit Extract, Glycine Soja (Soybean) Sterols, Tribehenin, PEG-10 Phytosterol, Magnesium Aluminum Silicate, Sodium PCA, Sodium Lactate, Sodium Hydroxide, Neopentyl Glycol Dicaprylate/Dicaprate, Cetearyl Glucoside, Tridecyl Stearate, Benzoic Acid, Behenyl Alcohol, Sclerotium Gum, Carbomer, C12-15 Alkyl Benzoate, Polysorbate 20, Disodium EDTA, Sorbic Acid, Chlorphenesin, Phenoxyethanol.